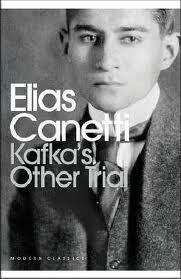 Although much of Penguin Modern Classics time now seems to be spent publishing what they call ‘pure classic escapism’, every so often they release something interesting and unusual, a perfect example being Elias Canetti’s Kafka’s Other Trial. Canetti was a restless Jewish intellectual, one among many who light up the literature of Europe during the twentieth century. Born in Bulgaria, educated in Vienna, he moved to London during the war, and then relocated to Zurich where he died in 1994 (having received the Nobel Prize in 1981). That he was restless intellectually can be seen from the fact that his best known works cover a number of genres: the novel Auto da Fe, a three volume autobiography, and a study of crowd behaviour, Crowds and Power. Kafka’s Other Trial is also a study, an examination of the letters Kafka wrote to Felice (which were published in 1967) in connection with his fiction, particularly The Trial. Canetti says he “found these letters more gripping and absorbing than any literary work I have read for years past.” The Penguin Classics edition of Letters to Felice comes in at around 700 pages so, if nothing else, Canetti provides a useful summary of the relationship. As only Kafka’s letters remain, his explanation of the circumstances surrounding the letters, including reference to other letters Kafka wrote at the time, is vital to a full understanding of the relationship, which is far from straight forward. Basically, if you’re writing a thesis on the emotional selfishness of artists then take a look at Kafka. His letters are almost entirely taken up by discussion of himself: his ailments, his writing, his constant anguish over their relationship. He is so self-absorbed it is difficult not to feel a certain amount of admiration for him alongside the repugnance. Kafka’s Other Trial is a fascinating work of biography and literary criticism. It is not a good introduction to Kafka because he is not easy to like outside his work, but for those who have read him it adds another dimension to understanding his work. You are currently browsing the archives for the Elias Canetti category.